At Armature Coil, we believe in coming up with novel ideas that make help several industries in increasing their efficiency. Among various innovations, we bring to you includes a revolutionary product – One Touch Control (OTC) Burn-off oven. These ovens are specifically designed to get rid of rubber, varnish, paint, oil, grease, epoxy, and other combustible materials from different metals. These ACE Heat Cleaning Oven Systems are capable of heat cleaning rubber-to-metal bonded parts, paint hooks, motor stators, and automotive engine parts, along with several other metals. Apart from this, these burn-off ovens also have the capability to break the bond of clutch plates, as well as brake shoes. The ovens have a wheel-in-cart arrangement, where parts are loaded. Once loading of parts has been done, heat of 650° - 800° F (340° - 427° C) is applied. The atmosphere in the ovens is deficient of oxygen. Decomposition of combustible hydrocarbon occurs here. This helps dry the parts loaded in the ovens, and ash residue is left behind, which can be easily removed. The rugged construction of these ACE ovens is due to 11 gauge steel material, which is used to manufacture them. Besides this, there is an addition of anti-rust or rust resistant paint. Also, this rust resistant coating is applied at high temperature. The oven has a great energy efficiency, thanks to the self-supporting exhaust stack, along with 4 inches of high temperature insulation lines of the oven. This insulation is rated at 2,300° F (1,260° C). The one touch control oven features a cam type latching mechanism. This helps seal the thick door securely. This latching mechanism is provided on the top, as well as the bottom of the oven door. 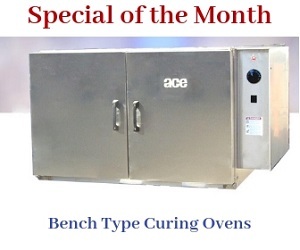 These ACE burn-off oven are extremely safe to handle. They feature a specially designed latch, which accepts a lock. Thus, the door cannot be opened while the OTC burn-off oven is operating. As said earlier, one touch control feature is the new technology in the burn-off oven design. Basically, OTC is a control system, which is capable of self-adjusting itself automatically. The combustible vapors present in the oven are sensed by this system, and are controlled at a safe level. Being an automatic system, it does not require human intervention in selecting a program, which helps eliminate all the possible chances of human errors. Besides this, the cycle time to the weight of combustible, as well as non-combustible load is self-adjusted by the one touch control system. Another advantage of this self-adjusting automatic system is that the chances of errors occurring in over or under processing are eliminated. In addition to this, the amount of combustible material in the load is rightly estimated by this automatic system. It does not require any operator intervention for selecting a menu. All you have to do is hit the start button, and the OTC burn-off oven is capable of doing the rest. Step 1 – The oven features a pre-programmed digital temperature control. This helps you to heat the load in the shortest possible time. The load is heated at high temperature. Step 2 – The oven has a primary and secondary water systems. If there is a rapid increase in the temperature, the primary and back up secondary system are not able to control it, then the main burner goes to low fire. Step 3 – The OTC will turn off the burners only when the oven load does not contain any combustible materials. The one touch control will turn off the oven automatically, once all the load is done. There is a provision, if power failure occurs. In such cases, the water spray system of the oven gets activated and the load is cooled down. Thus, the emission of odor, fumes, and smoke from the exhaust stack is prevented. The flooding of the oven is prevented by automatically turning off the water system after the oven temperature drops below 149°C (300°F). To know more about burn off oven with one touch control, please feel free to contact us at the earliest.